Red Rover Cremon Chrysanthemums are long lasting flowers. Each box contains only 100 stems. 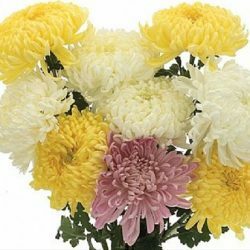 Red Rover Cremon Chrysanthemums are a wedding favorite and they are packed 100 stems per box. The stems are 65-70cm (24-28 inch) in length with a minimum of 3 usable flowers or blooms per stem. 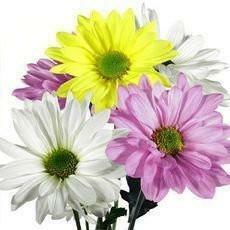 They are long lasting flowers and available in many colors. They are long lasting flowers that can last at least 9 days in water. There is one bloom per stem. We always suggest receiving these flowers 2-3 days before the event, that way the flowers can get re-hydrated and ready for your bouquets or arrangements. All Mums are available year round. Pictures shown online are a very accurate representation of the actual flower, however since flowers are a creation of Mother Nature and due to different variations in monitor resolutions, the exact color shades of this flower may vary to some degree.